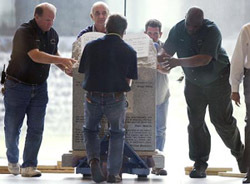 On August 27, 2003, a Ten Commandments monument in the Montgomery Alabama courthouse was forcefully removed. The former Alabama Chief Justice Roy Moore, and many other Christian supporters gathered together from all around the nation to pray and make a strong stand against this action. Alabama is my home turf, and so for over two months I made this a very serious matter of personal intercession. First, I will write a personal testimony regarding the spiritual warfare behind the removal of this Ten Commandment monument, because there is so much more going on in the Spirit behind this issue than just politics and opinions. Then I will answer some common questions regarding being put "under the law." On July 22, 2003, over a month before Judge Roy Moore's National stand, I participated in a statewide Christian prayer gathering here in Decatur Alabama where Dutch Sheets, Chuck Pierce and many local equipping ministers were present to hear Judge Roy Moore speak and then pray for him.31 My region of the country has a destiny for birthing unity and standing up for civil rights. Therefore, the Spirit of God is present in a powerful way here to intercede for JUSTICE and RAIN (an outpouring of the Holy Spirit) to flow from Alabama and go to the rest of America. I believe God is indeed about to judge that which does not line up with Him and His word. It was not a coincidence that on the very same day the Ten Commandment monument was removed that the planet Mars was at its closest approach to earth that has yet to date happened in history (this too was national news). Mars represents Michael the archangel who is the warring angel, hence WARFARE was the key message. In many ways it seems like the Church of America has positioned herself in a warfare stance against God's word. It was also not a coincidence that the day after they removed Roy Moore's ten commandment monument (Aug 28th) began the 40 day Jewish season of Teshuvah - a time of introspection / repentance / and returning to God before the high holy days in the fall. Teshuvah means "to return" in Hebrew. These 40 days include the Hebrew month of Elul (30 days), plus the 10 "days of Awe" which starts at the Feast of Trumpets and goes through the Day of Atonement. The message is that we need to repent and "return" to God's word. These Jewish Feast days are part of God's order for Christians to worship Him in truth. While this may sound pretty strange now, within the next few decades and centuries it will become more and more commonplace for Christians. Weekly small group meetings, larger monthly "tribal" meetings, and three yearly city wide meetings (Passover, Pentecost and Tabernacles) will soon become staple celebrations in the Church in replacement of the way we currently celebrate Christmas and Easter. Chapter 2 in this book contains a chart of this type of apostolic Church order. In Chapter 2 we saw how much of the pattern (or matrix) for church assebly is found in the Old Testament, which is the wrapper for containing the New Testament life in Christ Jesus. You MUST have the life before you use the pattern otherwise you will just have dead religious works. Nevertheless, we have neglected for far too long the correct pattern for having church out of fear of "legalism" or being "under the law." This brings us back to part of the warfare involved in the removing of the ten commandment monument. For the most part, the Church is removing the structure on how to assemble in "Church" by relegating the Old Testament to a secondary role in relevance to Church government. The foundation of the entire Scriptures is Jesus Christ, and the Word of God is neither old nor new, it is eternal. If we remove the Old Covenant from New Covenant Church practice we will pay the price of setting ourselves against God's pattern and be at war with His word. His word is a sword of JUSTICE and it is being drawn for sure, but we want to be on the right end of that sword! Although I am against the removal of anything that acknowledges God, I find it a bit ironic that Christians are making such a fuss over the removal of monuments bearing the inscription of the Ten Commandments when the Church long ago removed the Law from its life claiming it had been abolished at the cross. In the light of this, why is it important to get a "strong message" to the media and politicians of our society when we do not even acknowledge the place of God's Law in our own lives? Is this not just the same demanding of "rights" on the part of Christians as the world makes for what it considers its rights? The best way to fight the removal of the Ten Commandments from the fabric of our nation is to embrace those Law's on an individual level. What we need to be protesting is the fact that the government of the traditional church has not acknowledged the New Covenant promise of God to put His Law in our minds and write them on our hearts. It is ultimately the organized church's removal of the Law that has allowed our political leaders and religious dissidents to attempt erasure of any public symbol bearing the imprint of God's influence! The injustice here is the one of blaming unregenerate mankind, who does not know God, instead of pointing the finger of fault at Christians who have not exercised the power of God's Law to influence the unsaved by obeying the Law themselves. Exactly two years after this Ten Commandment monument was removed, hurricane Katrina struck New Orleans as well as my home state of Alabama (August 28, 2005). When you sow to the wind, you will reap the whirlwind. It is a spiritual law that works just as sure as gravity or any other law of nature. I don't think it was a coincidence that the planet Mars made its second closest encounter with earth on the same day that hurricane Katrina was at its strongest point the day before making landfall. The only recorded closer approach of the planet Mars was at the same time this Alabama Ten Commandment monument was being removed two years earlier to the day. Are you putting me under the law? Because the Lord's law has been given such a negative connotation in most Christian circles today, I would like to take some time to explain why loving the Lord's law is not a bad thing. A better translation of the word "law" or "torah" is "instruction." Once people come into God's Kingdom there must be some kind of instruction or teaching in the ways of God. God's law is instruction, and not some legalistic mumbo jumbo that people must follow. Once you have the indwelling of the Holy Spirit you WANT to follow God's instruction not because you have to, but because you want to love Him who first loved you. The problem is that our generation of "church" has been so removed from her Jewish roots that when instruction is given and it sounds "Jewish" (such as celebrating the Feast days) then people reject it as legalistic. However, in reality this order will bring us into liberty when we follow it after the Spirit. In reality every family, church group, company, organization and even nation ALREADY HAS some type of instruction that they already conform to. It may be unwritten and undefined, but a group of people cannot function together without some type of common understanding of laws and rules. Just consider any type of organized sporting activity. If there were no rules or guidelines and penalties for breaking them, then there would be no game! The question is: Are we going to organize according to God's instruction, or make up our own rules? According to Galations 3:29: "If ye are Christ's, then you are Abraham's seed, and heirs according to the promise." True Christians are New Testament spiritual Jews. The natural Jews were given the correct order for God's kingdom, but their leadership did not have the right heart attitude, so God looked to the Gentiles (see Rom 9-11). The true Church since Jesus (spiritual Jews) have been given the right Spirit (heart attitude) but we totally lack the proper order. This is due mostly because the early Church severed herself from her Jewish roots in order to compromise with the pagan traditions and bring in more "converts." Because I celebrate the Lord's Feast days, people have accused me of being led by rituals and wasting my time. But rituals in themselves are not bad. Rather it is when we start putting our trust in the rituals that it becomes sin. Any time we meet together on a larger scale with other believers, there will have to be some kind of structure (ritual) as to how you will share and worship. Why not follow the order for meeting that the Scriptures give? The Jews were given the divine order of worship, not Constantine and the Catholic church from which most of the modern day church derives its order of worship. We celebrate birthday's and the 4th of July and Thanksgiving, and there is nothing wrong with this. So, how much more should we celebrate and honor days that are special to God? Far from a waste of time, it is the best way to honor God with our time. One day soon, the whole earth will be celebrating these days. Why not get a head start on everyone! When Israel became a nation in 1948 the Church had to re-think her "replacement theology" where she said the Gentile church had totally replaced the natural Jewish people as God's chosen. Paul in Romans 11:1 says that God has not cast away the Jewish people. Since 1967 when Jerusalem was captured by Israel, there have been thousands of Jewish people who have come to know Yahoshua (Jesus) as the Messiah. These Jewish believers are being led by the Holy Spirit to still keep the Feasts as part of their faith in Jesus. They have a definite contribution to make to the Bride of Christ before Jesus returns, but who is listening? The "Jewish questions" are not going to go away, and they will be a stumbling block for many believers in our generation, just like allowing the Gentiles to come into the Church in the first century was a stumbling block for their generation. It is unfortunate that there are many people in the "Messianic Jewish" and "Hebrew Roots" movements that take these truths to extremes and put an overemphasis on the order (Feasts) instead of the content (Jesus). But it has always been a tactic of the enemy to discredit truth by pushing it to an over-emphasis. People who do not have first things first (a relationship with Jesus) will be out of balance in one form or another anyway. Following God's order is never a burden or a distraction when we do it in the Spirit, and we need to start talking about these issues because having a proper understanding of the law and the Feast days are a big part of God restoring ORDER to His body. I certainly don't claim to have the total revelation on this issue. It is going to take a company of revelation from the Lord to bring further light on this subject. Ephesians 2:14-16 says that Jesus broke down the wall of division between Jew and Gentile and that we are now ONE NEW MAN reconciled to God through the cross. So, Jesus is not coming back for a Jewish bride and a Gentile bride. He is coming back for ONE Bride. Therefore, we can't just say, "well, let the Jews do their feasts, and I'll do whatever I want." There is a biblical order that these "appointed times" bring to our worship and we must find the proper balance. Question: Why would we go backward under the law and follow the Jewish laws instead of forward toward grace and freedom? Answer: Jesus came "full of grace AND TRUTH." GRACE and Freedom can only be founded upon the TRUTH of God's eternal law. Without the foundation of law, you would never have known grace. You cannot throw out the foundation once you have found something better. They build on each other. We need both. Liberty is the goal of our democracy in America, but it is our legal system that preserves that liberty. Rom 3:31 says, "Do we then make void the law through faith? God forbid; yea, we establish the law." Here is an example: You have a set of train tracks which represent the LAW, and a locomotive train which represents GRACE. Taking away the train tracks (law) will not help establish grace, it will render it helpless! Romans 7:12,14 confirms, "Therefore the law is holy and the commandment holy and just and good... for we know that the law is spiritual." Question: Paul said to make no day holier than the next. If we celebrate the feasts and the Jewish roots aren't we putting ourselves back under the law? Answer: Even God Himself abides by certain immutable (unchangeable) laws (see Heb 6:17-18). The Ten Commandments are "Jewish" but most of the Church receives them as instruction. Why not the Feasts too? In regards to God's divine unchangeable law, the Church should have never left these Jewish roots. The dark ages are a result, in part, of the Church leaving her Jewish roots (see Rom 11:18). A return to Judaic principles (God's divine law) is part of the RESTORATION that God is doing in our generation. This return to the Judaic-Christian order does not make anyone righteous and it has no bearing on one's salvation. The law was never intended to make people righteous or to bring salvation. We are saved by grace through faith in Jesus PERIOD. The key, is to remember that celebrating the Feasts is a matter of order and maturity, and not right standing with God or a measure of your salvation. As for honoring certain days, Paul was writing to the Romans (ch. 14) not to JUDGE one another (see vs. 10) in regards to celebrating certain days (and he happened to be referring to Pagan festivals). To this I say, Amen! We cannot judge one's right standing with God based on who celebrates the Feast days and who does not. But Paul also wrote, "Christ our Passover was sacrificed for us, THEREFORE LET US KEEP THE FEAST" (1 Cor. 5:8). Paul, the great champion of grace, encourages us to keep the Feasts, because it is God's order and pattern for instruction in worship. Paul was "determined" and "in a hurry" to celebrate Pentecost (Acts 20:16). This does not put us under the law, but rather is a fulfillment of the law. God has written His law on our hearts, and He desires for His law to "be fulfilled IN US who do not walk according to the flesh but according to the Spirit" (Rom 8:4). Scripture gives us freedom to celebrate any day as special (Rom. 14:6). So, why should we NOT celebrate the biblical Feast days? Question: If we are going to celebrate the feasts then is it not hypocritical to not accept the rest of the law? What about circumcision? The Bible says that he who goes and becomes circumcised of flesh now is rejecting grace? Answer: The reason that the first century Jews were rebuked by Paul in regards to circumcision is because they were trusting in this good work as a sign of their right standing with God, instead of simply finding their righteousness by being found IN Christ. By doing this they rejected grace. I can't emphasize enough the need to distinguish SALVATION (right standing with God) from God's worship ORDER and discipleship training found in His eternal law (instruction). The key to differentiating the "fleshly ordinances imposed until the time of reformation" (Heb. 9:10) and God's eternal law is to WALK IN THE SPIRIT. "The law of the Spirit of life in Christ Jesus has set us free from the law of SIN and death," but not free from the eternal laws of God (Rom 8:2). The eternal laws of God operate much like the natural laws of creation such as gravity (Rom. 1:20), and they are for our BENEFIT. The New Covenant was a CHANGE in the law (Heb. 7:12), not a blotting out of the law (our sin is what was blotted out). Jesus came as a reformer, and therefore the MANIFESTATIONS of the law changed. One example is the sacrifices. We still offer sacrifices, only under the New Covenant we offer the sacrifices of praise and thanksgiving and our bodies as living sacrifices, instead of the animal sacrifices. So the eternal law of sacrifice is still alive, except the way that it is activated has changed. The manifestation of God's eternal law changes, so we don't live by the letter of the law, but rather the Spirit leading us. Question: If Jewish laws and customs will be a stumbling block to cause people to turn away from Christ, then let's drop the observances so that we might win those offended brothers back as Romans 14:21 says? Answer: Just because something is a stumbling block does not make it wrong to observe. Jesus Himself was a stumbling block to His own people, but I don't think we would disagree that He did the PERFECT will of the father. Whenever God moves in a different way from the established tradition, it will cause people to stumble because we are more accustomed to the order (outside actions) than we are to the living moving reality of the Holy Spirit. Celebrating the Feasts will be a progressive change and transition in the order of worship just like the temple change (from stones to people) was progressive when Jesus came the first time. I don't celebrate Feasts to gain acceptance or fulfill any kind of requirements before God. I do it because I love God and it honors HIS order. God is full of mercy and He will teach His people who have hearts to love Him HOW to worship Him more in TRUTH. We are at the dawning of a new age. The devil has stolen the term "new age" and uses it to describe those who practice divination, but the truth is that the 6,000 years that God allotted to mankind is expired, and we are in a transition into God's REST (The third day - millennial reign of Jesus). If God has determined to change the order of how we do/know/understand "church," then that is His prerogative and He will do it whether we join in on the action or not. I am NOT trying to "push" or create a "need" for anyone to celebrate the Feasts. Jesus Himself is the ultimate reality and having a relationship with Him is the first and utmost priority. The Feasts will point to this reality without usurping this all important focus IF we walk after the Spirit and not after the flesh. If God wants his people to celebrate His Feasts, then it is going to happen. If it is just an idea of man's, then it will ultimately fail. Just keep your eyes on Jesus and these things will come into perspective. Question: What should I do to honor the Feasts of the Lord? Answer: REMEMBER THEM. The Sabbath, and the Feasts are meant to be memorials of God's goodness. The fourth commandment says, "REMEMBER My Sabbath day to keep it holy." If all that you do is voice a simple, "Thank you Lord for your day of rest" on Saturday, it will be a good remembrance of His appointed Sabbath. Then BE LED BY THE HOLY SPIRIT. Whatever you do, make it enjoyable, because the Sabbath is a joyous occasion. When it becomes a burden, then you've left walking in the Spirit. I don't get caught up into a lot of do's and don'ts. The Sabbath was made for man, and not man for the Sabbath. I enjoy it. If necessary, I will do some work, but I generally try to spend time with my family. My children look forward to the Sabbath because we do fun things together as a family. The Sabbath is for the purpose of reminding us that we need to REST in God. Yes, we should be Resting in God EVERY day, but God knows that we need reminders, and so He has established certain days very specifically to be celebrated "forever" as reminders of certain truths (Lev 23: 14,21). I am not advocating that we celebrate the Feasts the same way that they did under the Old Covenant. We have a New Covenant and Jesus came as a reformer (Heb. 9:10) to "change" the law (Heb. 7:12), but not abolish it. We operate under "the law of the Spirit of life in Christ Jesus" so that "the law might be fulfilled IN US who do not walk according to the flesh but according to the Spirit" (Rom 8:2-4). I believe it is time for another reformation. God is calling His Church to His order, where the Sabbath and the seven main Feasts of the Lord are part of His worship plan. They should never be used to measure right standing with God or judge one another by who does or doesn't do something, but they can be used to remind us and instruct us about the goodness of God. I have observed that those with a fearful and negative view of God's Law are usually the most legalistic in religion; but those with a positive understanding of His Law are always seeking after God's amazing grace.